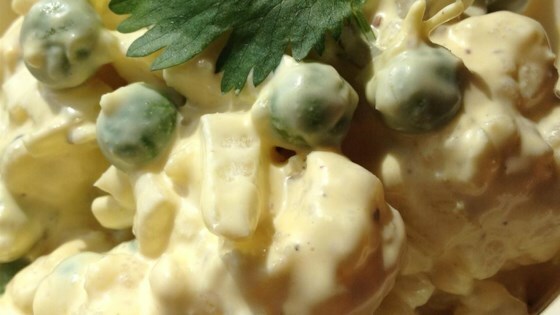 "I came up with this one summer when I was on a low carb diet, it is similar to a potato salad but made without the potato." Place cauliflower in a large saucepan and cover with water. Bring to a boil and cook until just fork tender, about 10 minutes. Drain and cool slightly. In a large bowl whisk together the mayonnaise, mustard, salt, and pepper. Add the cauliflower, eggs, onion, peas, dill pickles, and bacon to the dressing and stir until well coated. Cover and refrigerate for 2 to 24 hours. The longer the cauliflower salad chills, the better the flavor. See how easy it is to make this hearty, salad-bar-style salad. This salad really didn't do it for me and my family. I didn't use all of the same veggies but I did follow the recipe for the sauce and I think it was great I've never seen my boyfriend scarf down so many veggies in one sitting! I didn't add the eggs to save calories and low fat mayo, 1 tbsp of pickled relish instead of the dill pickles. didn't miss the eggs at all and soooo tasty!! Not being a fan of potato salad myself...I was surprised that I liked this dish. I blanched the fresh cauliflower until desired tenderness. Served with pulled pork sandwiches. Everyone enjoyed. Awesome as-is - even better with a little celery salt.